From hand-tied flower bouquets and chocolate to amazing handcrafted jewelry, home goods, art, photography, and more, you’ll find a curated selection of the best locally produced gifts and goods just in time for Valentine’s Day. 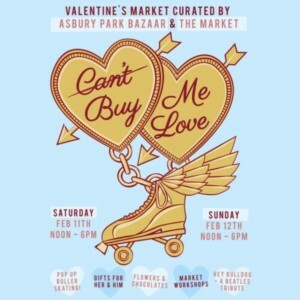 Roller skating comes to Asbury Park’s Convention Hall featuring food, libations & DJ Atom Worth who will model the music and atmosphere after the late ‘70s to early ‘80s roller boogie scene! The bazaar will feature a Vintage Pop Up during the day – so be sure to pick up that perfect roller skating outfit! Find out more at Roller Hall. Shop and enjoy live music by Hey Bulldog, a New Brunswick-based group of diverse musicians who play their favorite covers of Beatles songs. Come shop from an amazing selection of vintage vendors and relax in our newly constructed vinyl cabin! Grab a hot toddy, put on a record (or bring your own) and hang in our lounge while shopping for that perfect rollerskating outfit! Celebrate Valentine’s Day with Oysters & Champagne at the Oyster Bar & warm up with Hot Toddy’s at our Hot Drink Bar at The Anchor’s Bend. The Asbury Park Bazaar is a seasonal market where art, handmade, local goods, and live music converge in the Grand Arcade of Convention Hall, a beautiful, historic, building on the beach in Asbury Park, a unique shopping, dining and music destination on the Jersey Shore. The event is highly curated to bring you only the best in handcrafted local and regional gifts, goods, art, vintage, and music. Shoppers will find an array of local, handmade jewelry and accessories; unique gifts; artwork; socially-conscious goods (local, organic, fair trade, recycled and/or handmade); home goods, from plants to woven rugs and handmade wood furniture; natural candles, soaps, and skin care products for men and women; accessories like scarves, hats and gloves; natural teas, small-batch jams and more.